The scene of Saturday's fatal fire at a home on the 2200 block of North Colorado Street in North Philadelphia. A funeral mass will be held Friday for the Philadelphia firefighter who died attempting to extinguish a fire in a North Philly rowhome on Saturday. Lt. Matthew LeTourneau, an 11-year-veteran died after the second floor of the rowhome collapsed, trapping him under the debris. A resident also perished in the fire. The mass will be held at 11 a.m. at the Cathedral Basilica of Saints Peter and Paul, located at 18th Street and the Benjamin Franklin Parkway. It will be preceded by a pair of public viewings. The first will occur on Thursday from 4:30 p.m. to 9 p.m. A second viewing will be held on Friday at 9 a.m.
Internment will follow the mass at Saints Peter and Paul Cemetery in Marple Township, Delaware County. Additionally, Gov. Tom Wolf ordered all commonwealth flags at the Capitol complex and in Philadelphia to fly at half-staff beginning at sunrise on Tuesday. They will remain at half-staff until sunrise on Saturday. LeTourneau, a resident of Springfield, Delaware County, attained the rank of lieutenant in 2015. He was a 1993 graduate of Cardinal O'Hara High School and earned an associate's degree from Delaware County Community College. On Monday, the Bureau of Alcohol, Tobacco, Firearms and Explosives expressed condolences to the LeTourneau family and the Phildaelphia Fire Department. Mayor Jim Kenney, Fire Commissioner Adam K. Thiel and the Philadelphia Police Department previously offered their sympathy. "Our thoughts and prayers go out to the family of Lt. LeTourneau, who made the ultimate sacrifice while fighting this fire," said Donald Robinson, special agent in charge at the ATF Philadelphia Field Division. "We also extend our condolences to the Philadelphia Fire Department, which has suffered a great loss." 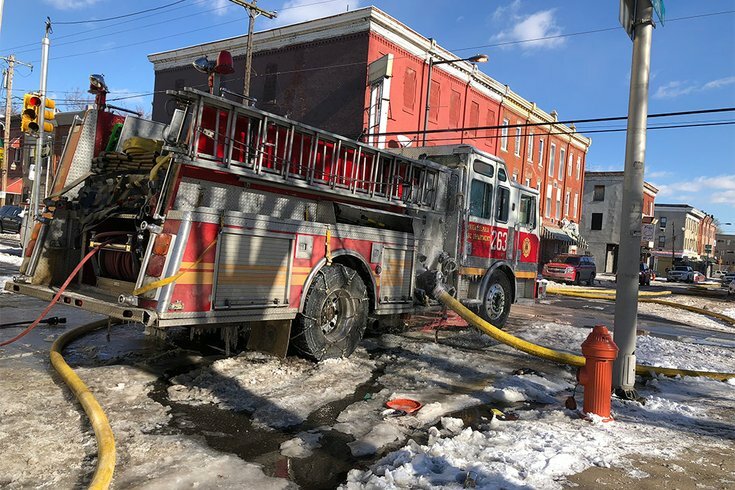 ATF also has activated a national response team to investigate a North Philadelphia fire, which also injured two other firefighters and a neighboring resident. The national response team includes forensic chemists, electrical engineers, explosives enforcement officers and veteran special agents tasked with determining the cause and origin of the two-alarm blaze. The fire erupted Saturday morning in a two-story rowhome on the 2200 block of North Colorado Street. The second floor of the home collapsed as firefighters fought the blaze, trapping LeTourneau under debris. He died as a result of his injuries. The ATF team arrived Monday to assist with the digital mapping of the residence, an effort that will provide investigators with a blueprint of the home. Investigators will then begin processing the scene to determine the cause of the fire. The ATF's Philadelphia office also dispatched its Arson Explosives Task Force to assist with the investigation. Investigators have not yet had access to the scene due to the instability of the structure and the impending storm expected to hit the Philadelphia region on Monday evening, according to ATF. ATF national response teams work alongside state and local officers to reconstruct fire scenes, conduct interviews, sift through debris and determine origin and cause. In November, an ATF national response team previously was deployed to investigate the blaze at the Barclay Friends Senior Living Community in Chester County. Four senior residents died in a massive fire that occurred just one week before Thanksgiving.